Yes, the St George locator seems a bit buggy. Try other postcodes – entering 3006 reveals the one on cnr of Williams and Little Collins, and a couple of others in that area, which you might find useful. I tried 3053 and 3051 for Calrton and Nth Melb, but the results didn’t seem very helpful. 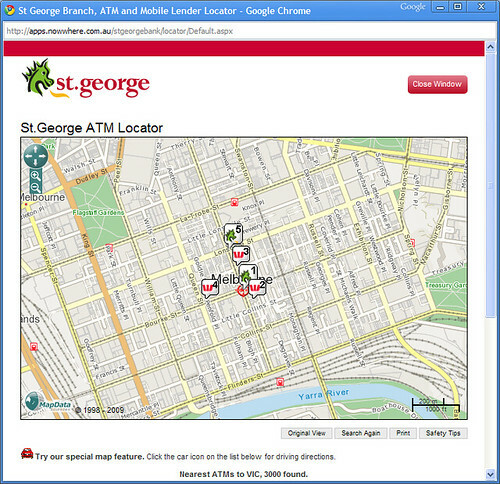 I bank with Westpac and I usually have little trouble locating a Westpac ATM when I need one. One thing I have noticed that I like very much is that in Australia oftentimes several ATMs from various banks will be located together in places like shopping centers allowing people to use their own bank’s ATM to avoid fees. I have not seen this in the US and there is usually just 1 bank’s ATMs available in a shopping center or other location. Quite often it is not one owned by your bank meaning a fee will be applied by the ATM and likely also by your own bank if you use it. By the way Westpac cardholders can withdraw cash from any Bank of America ATM in the US and vise versa with no fees applied by either bank. how about attempting to locate an ATM that accepts deposits over the net. Good luck! “Click the car icon for driving directions”!